McKinsey recently published a study that reveals the four most important behaviors of successful leaders. As the report says, “Over 90% of CEOs are already planning to increase investment in leadership development because they see it as the single most important human-capital issue their organizations face.” McKinsey research has often emphasized the importance of good leadership for organizational health. Although everyone knows leadership is important, there’s long been a lingering question of what aspects of leadership are most important to develop and reward. Should the focus be on communicating with staff? Modeling desired behaviors? Making quick decisions, or encouraging staff engagement? With so many leadership behaviors in the pot, it’s no wonder CEOs are unsure of which ones to focus on; only 43% of CEOs feel their investment in leadership will yield results. The research group then divided the survey sample into those with strong leadership (falling in the top quartile as measured by McKinsey’s Organization Health Index) and those with weak leadership (falling in the bottom quartile in the same measurement). 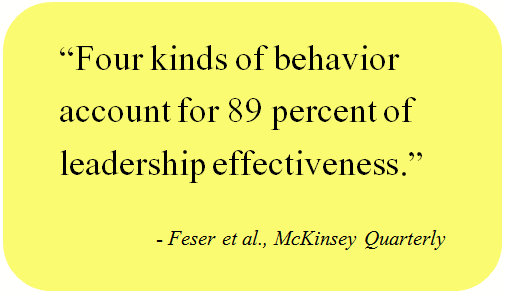 The results of this research study showed that just four leadership behaviors account for a whopping 89% of leadership success. In our experience, this is one of the most critical leadership behaviors in creating a culture of continuous improvement - and ultimately, a stronger, healthier organization. Leaders who support their employees in time of success AND failure establish trust and respect in the workplace, which foster creativity, efficiency, and collaboration. Employees with such continuous improvement leadership feel comfortable identifying opportunities for improvement, resulting in a stronger organization. Communication, engagement, and goal-setting are important behaviors for continuous improvement leadership, but they don’t result in anything without a direct focus on getting results. The McKinsey study says that leaders with a strong results orientation encourage productivity and efficiency, which in the end results in better work, more improvement, and ultimately, better results. Lean thinkers often say to focus on the process, but the best organizations also set goals and use a better process to get better results. I’m not at all surprised that this made the “top 4” list of leadership behaviors. Good leaders know that their opinions aren’t always spot on, and that often, their subordinates are better qualified to make an accurate assessment. Taking a variety of perspectives into account gives leaders a wider base of knowledge from which to pull, enabling them to make all around better decisions. McKinsey describes problem solving as “The process that precedes decision-making… when information is gathered, analyzed, and considered.” We couldn’t agree more with this assessment! We’d add to it, though, that even great leaders don’t typically have access to all relevant information when assessing problems, causing them to entrust a portion of the problem solving process to those employees that do have that perspective. Even the best leaders can’t possibly keep tabs on everything that’s going on in the organization. Great leaders gather their information from employees on the front line to ensure that they have all of the information they need for accurate analyzation and consideration, involving them (and supporting them) in the right balance. We write often about how the three characteristics needed for a successful culture of continuous improvement are leadership, methodology, and technology. We have a wealth of information available on the subject of leadership, including blog posts, eBooks, and webinars.